In Blade Runner 2049, graffiti on a door reads “____ off Skinner”. Any indication that this is a Simpsons reference? I wonder if anyone has suggested this, some bleed from our world into the fictional world. Why call a "skin job" "Skinner" if not from Principal Skinner in Simpsons? 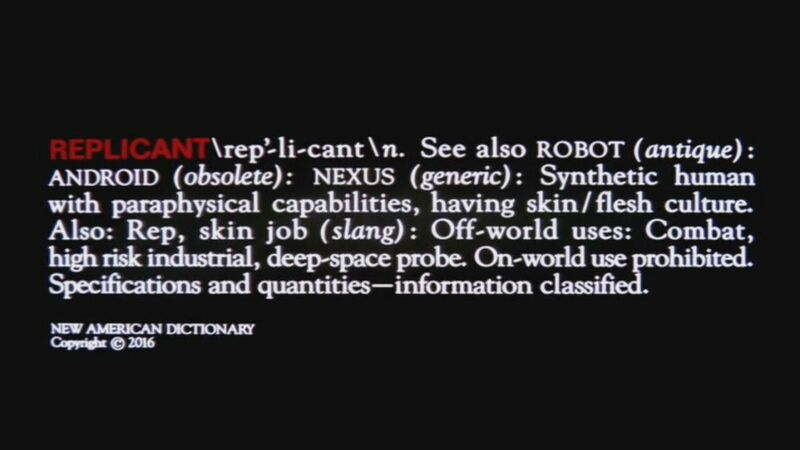 "Skin job" is indeed a derogatory slang term for a replicant, as we see in the opening of The Workprint Version of the original Blade Runner. "Skinner" appears to be an even more derogatory slur, likely meant to evoke the n-word. It also exists to demonstrate that language trends have changed somewhat in the three decades between the films, just as languages evolve in real life. What is the timeline of the creation of the replicants who figure in Blade Runner 2049? Blade Runner 2049: Joi and Replicant tech related?